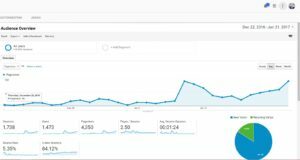 I want to share with you my little success in page views that I have been gaining ever since I started using BoardBooster. Hallelujah!!! Finally! After days upon days of trying to figure out to increase to 100 pageviews a day. I decided to try BoardBooster and NO! I didn’t get 100 page views I got more. My page views went up to 450 page views I was like what the hell. I was so shocked and excited at the same time. Yes, Lord! There is hope. I have decided to get serious with BoardBooster. For a short time blogging, It has been very very frustrating, and at times I want to give up, but I am determined. I have been told so many times get on group boards you will get 150,000 views instantly they say. Like some people have some serious luck, you know what I mean. Not all of us are blessed with that instant success. Even though they say get on group boards who is inviting new bloggers to successful group boards ??? Tell me! I have emailed so many people and no response. But if you are able to get accepted to good group boards that hooray to you my friend that’s a good step. Tailwind is a scheduling tool for bloggers or businesses. It helps manage your social media accounts such s Pinterest and Instagram. This is a software that automatically spreads your post/images to your social media account based on your preferred settings. You will never have to worry about spending lost of time posting images to your account. You will see an increase in followers, repins/repost and page views. Group boards work they actually do, they are just hard to get into. To find group boards you can use PINGROUPIE or go on your favourite bloggers Pinterest and look at the GroupBoards they have joined and try to see if you can get on a few of their boards. Above shows you my google statistics from my website. As you can see, I was coming from 18 views per day to and average 200 views a day. After I had gained my 400 plus viewers my free pins ran out, and I had no idea why, but still I was gaining views in the 100s and 200s a day. When I realise that BoardBooster does work, I watched youtube videos on how to make the best of BoardBooster, and since paying for it, my daily page views has been going up. There is no day since then I have ever been under 150 page views, Considering I am a new blogger with not much content. Oh, by the way, I haven’t even reached my second month of blogging yet, and I haven’t started using Pinterest or BoardBooster a month fully yet. Even though I have joined the approximately a month, I wasn’t using them at all. I am happy I decided to. My Pinterest followers are now 334, and it fluctuates it was 360 and growing and one day it just drastically dropped by 20 followers. Seriously don’t know what is going on there but eventually, It will all come back. I am very optimistic in my blogging Journey. Pinterest as been wonderful to me, 90% of my traffic comes from Pinterest. I am going to show you my Pinterest stats to show you where I am coming from. So, If you’re not using Pinterest or BoardBooster, then you are missing out. I like to think I am making progress, no matter how small, It is still progress. My goal for the next three months is to hit at least 30,000 pageviews a month. I would also really love to make my first blog profit and increase my presence on Pinterest. Ambitious huh? My page views have risen to 2,149, I was in the 2,000 regions for a few days, and then it went back down to 800 average views a day. I think that is still great. Even though I used BoardBooster to help me maximise my page views, I decided I wanted more so I signed up with Tailwind. I actually like Tailwind because of how convenient it is than BoardBooster. You can pin from anywhere without going into your account. This includes scheduling pins and saving pins to draft etc. Oh did I not mention too that it also gives you a recommendation on your Pinterest account, what you need to improve on and such and also provide insight on your potential and what you need to do more to increase your visibility and followers. IMPRESSIVE huh! The only thing I hate about it so far is that it’s not that easy to use at first. However, I like the fact that they provide an excellent tutorial that explains how to use it. 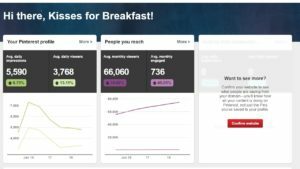 They now currently offer a free webinar “Mastering Pinterest & Tailwind: Scheduling and Analytics” by Learning how to grow your Pinterest presence through scheduling pins and analysing results using Tailwind. In order to take advantage of this webinar, you need to sign up with them first. I manage to get a nice little gift for anyone who is interested in trying Tailwind. You will receive a Free Month Trial And $15 Credit. StumbleUpon is gold. If you ever go viral on Stumble God bless your soul. I found out about StumbleUpon just a few days ago and boom there was all this traffic. What is StumbleUpon you ask? Well, this is a web search engine that finds and recommends web content to its users. What it does is basically allow users to stumble upon random content that is in the user’s interest. It allows them to like, dislike, share the content and the option to add to a list (like a folder) of their saved content. If not they can just stumble and stumble on till they find anything that interests them. The more likes the content gets, the more it stumbles upon a wider audience. I have heard of many bloggers gaining success from joining facebook groups and it is true. I have a joined a few and I can say at least one has helped me to gain massive repins and page views. The rest mainly helps with questions and answers and information that may help bloggers along the way. I suggest finding a great facebook group that resonates with your niche and make use of it. 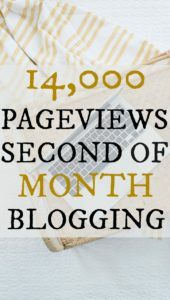 I have successfully gained 14,000 page views in one month in my second month of blogging. I am not far from my goals of at least 30, 000 page views a month. However, Google didn’t include Jan 31st stats which is today. (I just couldn’t wait until they updated it. LOL, I am all about maximising my potential, if you have any suggestions on what you use to maximise your potential, please let me know in the comments below. Frankly, I get weary of this blogging, but I won’t give up I am trying. It gets through but I won’t back down, not now. Thanks kimi!!! !you will do great, just be patient. are your suggestions only for pinterest? Thanks! Not only but it’s a tremendous boost for your website traffic wise when used the right way. Facebook and other social do drive traffic but it is way harder and usually more costly due to Changes in the algorithm.